The primary function of the red blood cells, or erythrocytes, is to carry oxygen from the lungs to body tissues and to transfer carbon dioxide from the tissues to the lungs. Oxygen transfer is accomplished via the hemoglobin contained in red blood cells. Hemoglobin combines readily with oxygen and carbon dioxide. Oxyhemoglobin in arterial blood reflects a bright red color while carboxyhemoglobin of venous blood appears dark red. To enable the maximum O2 saturation of hemoglobin, red cells are shaped like biconcave disks. The shape provides more surface area for exposure of hemoglobin to dissolved oxygen. Red blood cells are also able to change shape to permit passage through small capillaries that connect arteries with veins. The RBC is a count of the number of red blood cells per cubic millimeter of blood. In response to hypoxia, the hormone erthyropoietin, secreted by the kidneys, stimulates the bone marrow to produce red blood cells. The formation of red blood cells is known as erthyropoiesis. Erythropoetin produced in the kidney stimulates the bone marrow to produce more red blood cells. An increase in red blood cell mass is known as polycythemia. Normal physiological increases in the RBC count occurs at high altitudes or after strenuous physical training. At high altitudes, less atmospheric weight pushes air into the lungs, causing a decrease in the partial pressure of oxygen and hypoxia. With strenuous physical training, increased muscle mass demands more oxygen. The drugs gentamicin and methyldopa have been associated with increasing the number of red blood cells. Smokers also have a higher number of red blood cells than non-smokers. There are also pathological reasons for an increased number of red blood cells. Polycythemia vera is a disease of unknown origin that results in an abnormal increase in red blood cells. Polycythemia vera is referred to as a "primary polycythemia" because the overproduction of red blood cells does not result from hypoxia. The term "vera" means true; thus polycythemia vera refers specifically to overproduction of red blood cells in the bone marrow not caused by a physiologic need. Polycythemia vera is treated by radioactive phosphorus to slow down bone marrow overproduction of red blood cells. Hydration is an important consideration when caring for patients with abnormally high red blood cell counts. Very high RBC mass will slow blood velocity and increase the risk of intravascular clotting. Examples of "secondary polycythemias", that occur in response to hypoxia, are chronic lung disease in adults and children with congenital heart defects characterized by cyanosis. Smokers have more red blood cells than non-smokers do. Chemotherapy or radiation side effects from treatment of bone marrow malignancies such as leukemia can result in bone marrow suppression. The term "anemia" is a general term that refers to a decrease in red blood cells. Anemia can occur from either a decrease in the number of red blood cells, a decrease in the hemoglobin content, or both. Red blood cells live for approximately four months in the bloodstream. 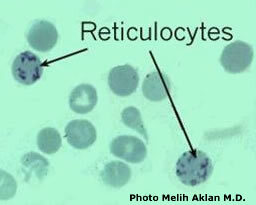 A reticulocyte count measures the numbers of reticulocytes, immature forms of erythrocytes, circulating in the bloodstream. The dark intracellular features are vacuoles which contain the remnants of organelles including: ER, Golgi, mitochondria. The vacuoles and their contents are released from the cell as it matures. Normal ranges for reticulocytes are 0.5% to 1.5% of the total numbers of red blood cells in men and 0.5% to 2.5% in women. A low reticulocyte count is seen with cirrhosis, folic acid deficiency, and bone marrow failure. A high reticulocyte count indicates that the bone marrow is responding to the need for increased red blood cell production. A person who has recently donated whole blood or who is responding to treatment for anemia would be expected to have a high reticulocyte count.